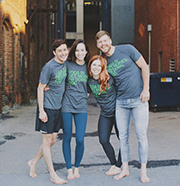 Emily Boyd and Derek Cassaday are the powerhouses behind Pop Up Yoga. Photo by Karla Conrad. There’s a new band of yogis setting out out to make yoga more accessible to the community. Emily Boyd and Julia Hogren created Pop Up Yoga to offer yoga classes that will pop up almost anywhere in Des Moines, such as in parks and galleries, on rooftops and even in front of warehouses. The classes welcome all levels of students, whether you’re a first-timer or a seasoned practitioner. They are free to attend, but some special events will be donation-based to support a local cause or charity. So far the community has embraced the idea. The beloved T-shirt empire Raygun has partnered with the initiative to sell “Yoga in Des Moines: I’m Down, Dog” shirts in-store and online. Classes have already started. For more information and to see the schedule, check out popupyogadsm.com, like the group on Facebook and follow them on Instagram @popupyogadsm.